More Than Mowers has a wide range of the best cordless battery lawnmowers, many models available with the latest lithium-ion technology. This rivals the power of petrol and offers long run times and quick battery recharging. A cordless mower offers an environmentally friendly mower as there are no fumes. An advantage over an electric mower is that you have no restrictive cord. We always endeavour to offer the best price we can on any cordless battery lawnmower. If you are local to Melksham, Wiltshire drop into our workshop and showroom. If you are elsewhere in the UK give us a call or order online. Lightweight plastic housing for high maneuverabilityConvenient central cutting height adjustmentFold.. Battery and charger included6 height adjustments34cm cutting widthUp to 200m² lawn sizeIf you like t..
Cobra offers an exceptional range of Lithium-Ion cordless lawnmowers - offering exceptional performa..
Change the way you mow your lawn with the AL-KO 38.5 Li Energy Flex. A quieter, greener option with..
• The most powerful rechargeable mower on the market• Convenient push-button start• 3-i.. 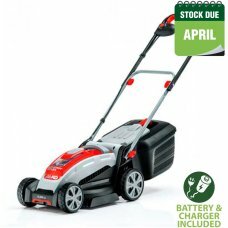 Battery and charger included 6 cutting height adjustments 38cm cutting width Up to 500m² lawn siz.. Welcome to the stylish Cordless li-on battery powered Rear Roller mower from Cobra - currently a uni..
•	Telescopic handles•	Grass box ‘full’ indicator•	Battery charge level is visible•	2.5Ah Battery and..
42cm / 16in cutting width7 stages cutting height 30 - 75mm60 litre grass bagFor lawns up to 400m²Bat.. This MX46S40V is an 18in self propelled lawnmower with a 40V li-ion battery. The Cobra range of Li-i..
•	Telescopic handles•	LED Lights•	Grass box ‘Full’ indicator•	Battery charge level is visible•	5.0Ah.. The NEW EGO LM2011E 20 Power+ Steel Deck Cordless Mower is the first lithium-ion mower to exceed the.. 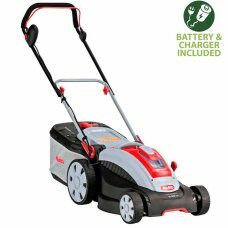 The new to the market AL-KO 42.5 SP Li Energy Flex Cordless Lawn Mower eliminates the need for cable..
42cm / 16in cutting width7 stages cutting height 30 - 75mm60 litre grass bagSelf-PropelledFor Lawns .. The new to the market AL-KO 46.5 SP Li Energy Flex Cordless Lawn Mower eliminates the need for cable..